PLEASE READ THESE TERMS OF OUR WEBSITE USE AND DISCLAIMER VERY CAREFULLY BEFORE USING OUR WEBSITE. While using this website you have agreed to the TERMS OF OUR WEBSITE USE. If you do not agree with our terms, you are not allowed to use our website. 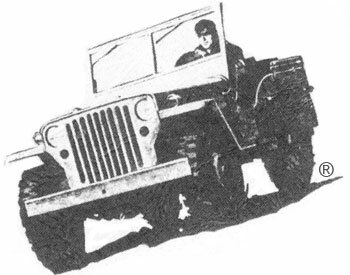 WILLYS JEEP PARTS, LLC reserves the right to at any time, modify, alter or update these TERMS OF OUR WEBSITE USE, and by using this website you have agreed to be bound by any such modification, alteration or update. The content of this website changes daily, sometimes hourly. We recommend refreshing your browser regularly while using this website. Permission to use any materials of this website other than for the sole purpose of placing an order with WILLYS JEEP PARTS, LLC is strictly prohibited. All of the materials on this site to include images, text, format, concept and design are copyright protected. Be aware the all images are watermarked and cannot be used without an explicit agreement from WILLYS JEEP PARTS, LLC. Product names, logos, part numbers and text included herein are the trademarks and or registered trademarks of their respective owners. WILLYS JEEP PARTS, LLC has been granted the rights to use these product names, logos, part numbers and text by the respective owners. These trademark names, logos, part numbers and text may not be modified, used, downloaded, copied or distributed in any way. No use of, copying or transmission of these trademarks and our copyrighted materials may be made under any circumstance without an explicit agreement from WILLYS JEEP PARTS, LLC. The part numbers, photos, illustrations and drawings used herein are for reference purposes only. No implication is made, unless otherwise noted, that these items are the products of the original manufacturers. Part numbers prefixed with the letters DMC are products licensed by DAIMLERCHRYSLER CORPORATION. Part numbers prefixed with the letters OEM are original equipment manufacturer products. We go to great lengths to locate as many American made OEM parts as possible. These newly manufactured parts are from the original suppliers such as Timken, Monroe, Spicer, Bower, Bendix, Wagner and many others. Part numbers prefixed with the letters NOS are new old parts from the original manufacturers. These may be military surplus or from Willys-Overland Motors, Inc. These parts may be more than seventy years old yet are still in serviceable condition. Parts or part numbers prefixed with the letters TO are used take off parts that have been removed from Willys vehicles and may or may not be in refurbished or serviceable condition. All other parts listed are aftermarket replacement parts. Part numbers, illustrations, and images used herein are for reference purpose only. No implication is made that these are original equipment parts or that they are approved by these companies. Rebuilt parts are generally components such as engines, transmissions, transfer cases, axle assemblies and steering gearboxes that we or our subcontractors have rebuilt to serviceable condition in accordance with the Willys-Overland Motors maintenance and repair manuals. WILLYS, WILLYS-OVERLAND, JEEP, CJ, DJ, FJ and FC are registered trademarks of DAIMLERCHRYSLER CORPORATION. WILLYS JEEP PARTS, LLC is not affiliated with DAIMLERCHRYSLER CORPORATION. WILLYS JEEP PARTS, LLC reserves the right to make changes to this site, at any time and without notice, to prices, specifications and models and is not responsible for typographical or image errors.